Race to collect the necessary materials needed to build your tower! The ruler of the desert kingdom looked down on the map and frowned. Surrounding his small country were well-traveled regions, and yet, his small domain remained unnoticed. No more, he vowed, and he called for his underlings to attend him. He decreed that a royal invite would be sent out to all the land calling for skilled craftsman to build the tallest tower the world has ever seen! Having such a tower would certainly bring wealth to his kingdom and the craftsman who built it! 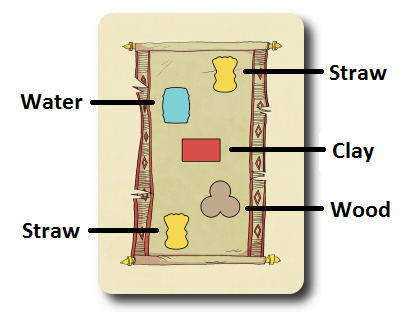 Tower, designed by Ben Haskett and published by the Game Crafter, is comprised of 18 Building Material wooden tokens (in the shapes of yellow straw bundles, orange-red clay bricks, brown stacked wood, and tan barrels for water), 12 Tower segments (stackable), 4 Builder pawns (classic meeple look), 1 Jewel bag (simple cloth back with a draw string), 90 Jewels (small plastic discs in the colors of green, red, and blue), 10 Black Market Pass tokens (same size and shape as the Jewels, but black in color), 18 Build cards (standard playing card size and thickness), 18 Black Market cards (standard playing card size and thickness), 6 Market tiles (thick cardboard and about the same size as a drink coaster), 1 Palace Tile (same size as Market tiles), 1 Salil tile (same size as Martel tiles), and 4 turn sequence tiles used as player aids. The component quality for Tower is excellent, but what will immediately catch the eye is the outstanding artwork. The game’s artist, Derek Bacon, did a wonderful job of matching the illustrations to the game’s theme resulting in a stronger overall game narrative. To set up the game, first place the 90 Jewels and the 10 Black Market Pass tokens in the Jewel bag. Shake the bag to mix up the bag’s contents. Set the bag aside. Second, place the Palace tile and the 6 Market tiles face-up on the table in any order that makes sense to the players. All the players should be able to touch any of the tiles from where they are sitting. These tiles represent the city. Place the Salil tile next to the city at this time. Third, take the Building Materials and place them on the Market tiles. Each Market Tile will have a space specifically dedicated to 1 of the 4 Build Material wooden tokens that are matched by color (yellow circle for Straw, blue circle for Water, etc.). Only one Building Material token can ever occupy any circle at a time. 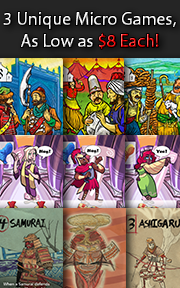 Additionally, the number of players will determine what each Market tile will have available. For example, one Market tile will have Straw and Wood, but not Water unless there are 4 players in the game. All 18 Building Material tokens are used only when playing with 4 players. Any Building Material tokens not placed are removed for the duration of the game. Fourth, shuffle the Build deck and the Black Market deck. Deal to each player 1 Build card. These cards are kept face-up in front of the players at all times and show what materials and how many are needed to build a single tower segment. Set both decks, face-down, next to the city and within easy reach of all the players. Fifth, hand out 1 turn sequence tile to each player for quick and easy reference, 1 Builder pawn, and the 3 Tower segments that match the Builder pawn’s color. That’s it for game set up. Let’s get building! The game is played in turns with no set number of rounds of play. A player’s turn is comprised of several steps which are summarized here. During this step, the players receive their income that is used to buy Building Materials. Players draw 3 Jewels from the Jewel bag blindly. If the Jewel bag ever becomes empty, all the Jewels currently located by the Salil tile are placed in the Jewel bag. During this step, the players to do several things in any order they like. Buy Building Material: the players review the Market tiles and see if any of the Building Materials they need (as identified on their Build card) are currently available and if they can afford them. Surrounding each Building Material on a Market tile will be a series of colored dots (green, red, and blue). These represent the quantity and the color of the Jewels needed to purchase the Building Material. If the player does purchase the Building Material, it is taken from the Market tile and placed on the player’s Build card. The Jewels spent are placed next to the Salil tile. Note that players can only buy Building Materials they need (as indicated by their Build card). When visiting a Market tile, the player places their Builder pawn on it. Only one Builder pawn can occupy a single Market tile at a time. If an opponent’s Builder pawn is occupying a Market tile, the player cannot access it. Builder pawns cannot loiter, however, and must either be moved on the player’s next turn to another Market tile that contains Building Material the player needs or returned to the player. The Builder pawn can remain on the same Market tile if the player can purchase more Building Materials supplied by the Market tile. 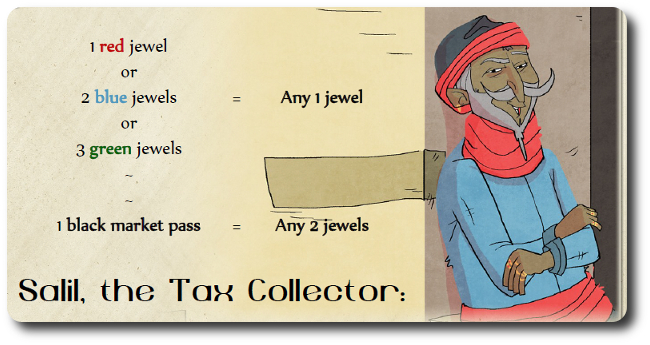 Trade with Salil: Salil is the city’s enterprising tax collector. All money spent in the city goes through him and he is more than happy to deal with the players before the money is given to the city’s bookkeeper. Of course, he pockets a bit of the jewels for his trouble, but one cannot fault the man as he does provide a very valuable service. Through Salil, players can exchange Jewels. Salil is only able to exchange Jewels he currently has on him (those deposited next to this tile). It should be noted that Salil is very fair, but very expensive. Visit the Black Market: hidden within the Jewel bag are black Jewels that allow the player to visit the Black Market. If the player likes, they can turn in the black Jewel to Salil for Jewels of specific colors, but that would be wasteful. The Black Market provides services not found in the Markets and are highly dubious, but more to the point, give the players a competitive edge. The black Jewels only get the player in the Black Market, however. They must still buy the goods they want using their Jewels. For those who are particularly well off, enough green, blue, and red Jewels will also allow a player access to the Black Market. Once the player is ushered in, 3 Black Market cards are drawn. From these 3, the player selects one and takes it, placing the other two back on top of the deck. The player now has access to this card, but must pay for it before they use it. A player can only have 3 Black Market cards at a time, and once spent, are discarded. If the Black Market deck is ever exhausted, the discard pile is shuffled and a new deck is created. Any Jewels spent to enter the Black Market are given to Salil. During this step, the player can place one of their Tower segments on the Palace tile. If this is the player’s first Tower segment it is simply placed anywhere there is free space. If it is their second or third Tower segment it is placed on top of previously placed Tower segments of the same color. A Tower segment can only be built if the player has collected all the necessary Building Material tokens as indicated on their Build card. All Building Material tokens used are returned to the Market tiles (player’s choice regarding Market tile location), but the Building Material token must match the colored circle and only one Building Material token can occupy a circle at a time). The Build card is discarded and a new Building card is drawn. The first player to build their 3rd Tower segment wins the game! The original game’s rules had the players keep their Build cards hidden from their opponents at all times until revealed when building. After many game play sessions and feedback, the game designer decided the game could benefit from a bit more urgency to get Building Materials as quickly as possible. Knowing that your opponents needed the same limited resource as you makes it very important to get to the resources first. This change made the game a bit more cutthroat and a lot more stressful for some. As such, the original rule of keeping the Build cards hidden is now considered the “family friendly variant” for Tower. This is the only rule change for the entire game, but it is enough to make the entire game playing experience much more relaxed. To learn more about Tower and read the full rules, visit the game’s web page on the Game Crafter. Tower would appear to be a very straightforward worker placement and set collecting game. What is really interesting is that the materials needed to build the Tower segments are rather limited. When a player grabs a Straw token, for example, that Straw token is essentially out of the game for the player’s opponents until such time it is returned to the Market tiles. Of course, the Black Market allows the players to circumvent the resource restriction issues via dirty dealings, but taking such a path is very expensive. It’s a wonderful mix of critical thinking, strategy, and tactics that is presented in a very easy to teach and to learn game. I don’t see anything in the game rules to suggest that Tower will be anything but approved by all three of our groups. 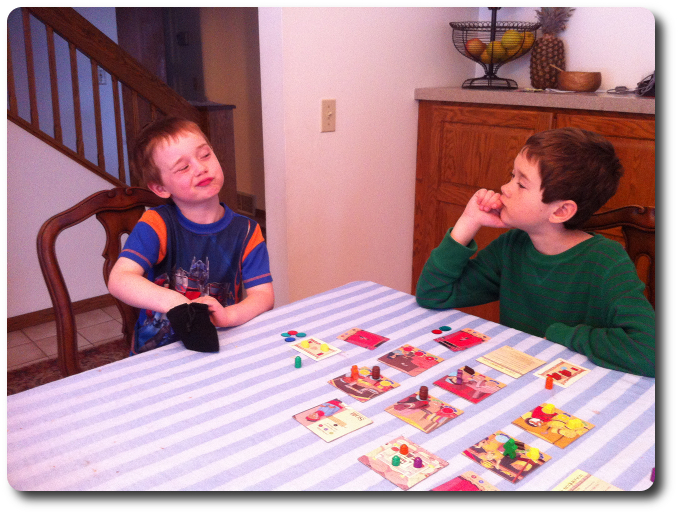 For the Child Geeks, the rules are easy to learn and the game play is easy to follow. The game is also relatively short and fast, making it a game the Child Geeks can endure if they are loosing. For the Parent Geeks, the game is very casual and the game flow can be interrupted without causing issues to the game play. I imagine even the non-gamers will enjoy Tower. For the Gamer Geeks, Tower is clearly a lighter game than what they would be used to, but the game’s theme and the game mechanisms will most certainly appeal to Gamer Geeks who enjoy a good worker placement recourse management race game. Teaching Tower is a very simple exercise. What you should spend time on is the Black Market. We briefly showed all the players what was available in the Black Market deck. Everything from stealing materials from opponents to butting in line and being served first in a Market tile. Knowing “why” you would want to spend Jewels for the Black Market cards is going to make the game that much easier for the players because it can be very frustrating to want something very specific and not be able to grab it using the more “traditional” means offered in the game. 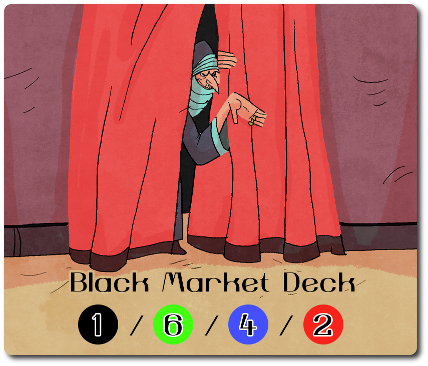 The Black Market is a backdoor, a cheat, and a fun way to hopefully get what you need to win. None of our players had any questions after we taught them the game. Even the non-gamers were surprisingly quiet and were just eager to play. And so, as I set up the game for my two oldest little geeks and I to play for our first game play session together, I asked them their thoughts on Tower so far. My 5-year-old is correct. He can most certainly play Tower by himself, but the Black Market cards have a great deal of descriptive text on them that needs to be read out loud. I don’t see anything in the rules to suggest that reading a Black Market card to another player would ruin their game playing experience. This is good news, as it will allow players who cannot read well to join us at the table. Let’s play Tower and see if this game builds up to a fun time for all or falls crashing to the floor. The Child Geeks really liked Tower, but only the older Child Geeks. The younger Child Geeks had a hard time keeping interested in the game. As predicted, reading the Black Market cards did not reduce their level of fun, but there were a few key game mechanisms that were lost on them. Specifically, the game’s market system and lack of resources. The Market fluctuates throughout the game, but what is available is largely dependent on what the players don’t want or simply cannot afford. Knowing when to buy and when to wait is necessary. Players must look to their opponents’ Build cards to see what Building Materials will be hotly contested over and then plan accordingly. The older Child Geeks understood this, but the younger CHild Geeks did not resulting in them be lost and lacking the materials to build. As such, we cannot recommend Tower for players any younger than 8-years-old. All our players who were 8-years-old and older did an outstanding job and had a fantastic time. They all agreed to approve the game. The Parent Geeks very quickly understood the nature of the game and bought up the Building Materials as quickly as they could. After that, they invested heavily in the Black Market that made the game strangely cutthroat. Whenever a player would invest in the Black Market, their opponents gave them the most evil and stickiest of looks. Black Market cards are “cheat cards”, plain and simple. And no one likes a cheater. Needless to say, players who did use the Black Market cards became exceedingly unpopular at the gaming table, which might have been the game designer’s intent. But you cannot team up against other players in Tower and there is no such thing as teams. It is everyone versus everyone, which was just fine with the Parent Geeks when playing with their peers, but there were some hurt feelings when Parent Geeks stole from their Child Geeks. Not surprising, the Child Geeks rejoiced when they were able to steal from their Parent Geeks. 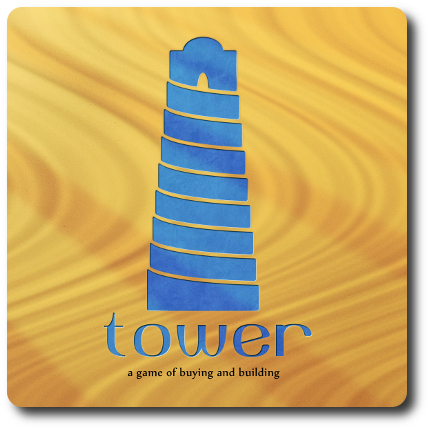 Despite the occasional emotional flare up and pouting from some of the younger players, the Parent Geeks happily approved of Tower, finding it to be an excellent game with both their family and their peers. For the Gamer Geeks, Tower did not overly excite. Nor did it disappoint. There is nothing included in Tower that a well seasoned Gamer Geek elitist veteran has not seen before. The end result is a game that holds no surprises for the Gamer Geek, but is so well refined and well designed, it is a great deal of fun to play. In fact, there was nothing about the game the Gamer Geeks found to be off-putting. According to one Gamer Geek, “This is the kind of game I would expect to find in a game store and in my gaming collection.” Good gravy! It doesn’t get much better than that! Or does it? Another Gamer Geek said, “This is my new go-to easy resource game. Goodbye, Catan! Hello, Tower!” All the Gamer Geeks we played the game with agreed on three essential points. First, Tower is a light game and would be perfect for late game nights or for shorter game play sessions. Second, Tower is not doing anything new, but is nevertheless creative. Third, while the game plays fine just the way it is, they would like to see some game rule variants that introduced a more robust economy where prices rose and fell based on demand. The Gamer Geeks approved Tower without argument. Tower is a well designed game from start to finish. It’s light and quick to play, and yet demands that the player keep close watch of their opponents and the market. The game is one part race and one part worker placement, where the finish line is well-defined, but never the path to get there. Every piece of the tower must be worked for, good timing is crucial to success, and there is no such thing as luck. It will quickly become apparent that the local economy is woefully lacking the necessary materials needed and using the Black Market, while expensive, is the only way to truly get ahead. This puts the player is an interesting situation. Do they spend their money and hope they get what they need from the Black Market or do they save their money and wait for an opportunity to present itself? Both are viable strategies, but a player must mix the two to be truly successful. I am most pleased with Tower. Everyone I have played it with has enjoyed its easy rules and casual play. The game has depth, has never been the same game twice, and has a great deal of visual appeal. The more players you have, the more resources are available, but that does not make for an easier game. The game designer has done an excellent job of creating a game that is both entertaining and frustrating in equal parts. Neither one cancels each other out, but instead compliments the other in perfect balance. And I can tell you that the feeling of joy one gets when they build their third Tower segment is explosive. Tower is truly a wonderful game and well worth every player’s time at the gaming table. Tagged Child Geek Approved, Father Geek Approved, Gamer Geek Approved, Parent Geek Approved. Bookmark the permalink. Tower is a fantastic and easy to pick up and play game. A really great gateway game for sure! We are in agreement. See? Isn’t it better to get along instead of fighting? Thanks a million for the review, Cyrus! I’m thrilled that you all enjoyed it so much!! And THANK YOU for such a great game, Ben! I enjoy the idea of a casual game being cut throat. It is kind of like intentionally blocking certain lines in Ticket To Ride even if you didn’t really need it. My gaming group would probably appreciate that sort of play. The art aesthetic is pretty endearing too. Thanks for taking the time to read and to comment. 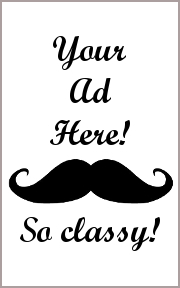 As a reward for your awesomeness, I will now bore you with a personal story, Ferrel. When I last played Ticket to Ride with my youngest brother, I purposely blocked routes that I didn’t need but knew he was going after. My brother and sister grumbled, but my wife new exactly what I was doing and just worked around me, playing smarter and being craftier. When we reached the end of the game and I revealed my Destination cards that I had not completed, my brother FLIPPED THE HECK OUT! I let him rant himself out and then calmly passed him the rule book, asking him to please find that rule. He looked and looked and looked. He didn’t speak to me the rest of the evening.